Gambia Birding Experience is an initiative by Henk Schuurman who is an amateur photographer from Holland and Foday Bojang who is a professional bird guide from The Gambia. They started having contact over the internet for several months about photographing in general and the potential that Gambia has to offer for that specifically. Finally after the summer of 2015 Henk decided to go to the Gambia and experience the Gambia himself in a 15 day round trip. Looking around the internet for pricing of existing birding travel companies they turned out to be quite expensive. Obviously because of all the overhead and other things they have to deal with being a commercial company and all. He decided to talk to Foday for options and they agreed to do it together. Henk was from then on dedicated to use the trip as a blueprint for an All-In experience he would be glad to offer to his direct photographing and birding friends / contacts in Holland. Many of them never been to the Gambia because of the pricing and the unknown factor of where you woud get yourself into going alone or without a travel agency. It might be the same for you reading this section so please read on for what we can do to also help you out on that. For Henk who did not know anything about it before going there, the Gambia turned out to be a very beautiful but also safe and pleasant country to visit. The people are kind and willing to share the very little things they have. The president, who is loved by the people, has done a lot to improve safety for all and improve other things like the roads and when Henk was there indeed the roads were very good. Everywhere in the Gambia including the inland you will see Police, Military and customs check points making sure everyone is save and stays save. It is very common for women and girls to walk in the dark along the roads after sunset to the area with all the bars and restaurants in one of the nearby towns. Henk enjoyed the local food on several occasions in restaurants or with local staff in the lodges were they were more then pleased to share their lunch with them. It was because of that Henk decided to also take up two evening dinners at local restaurants to enjoy the nice Gambian kitchen and pleasant atmosphere in the Experiences. Henk and Foday talked to owners of Hotels, Lodges and transportation companies with an air-conditioned bus about pricing in case we would come back with larger groups to the Gambia and everybody was very pleased with the initiative and wanted to help and be a part of this initiative. It was quite obvious that we could not do it with the two of us so Foday selected 3 more bird guides to be added to our team. Every single one of them are very experienced and capable of leading a team of customers by themselves let alone doing it with two of them we want to do as standard as possible during our experiences. Based on the content of the group of customers these guides would take turn in joining our experiences and in case of succes and double bookings we can run two experiences at the same time. It is very important we reach and maintain a high level of service we want to achieve with this initiative. Now a couple of months after the trip this website is created and ready to book your experience with us. 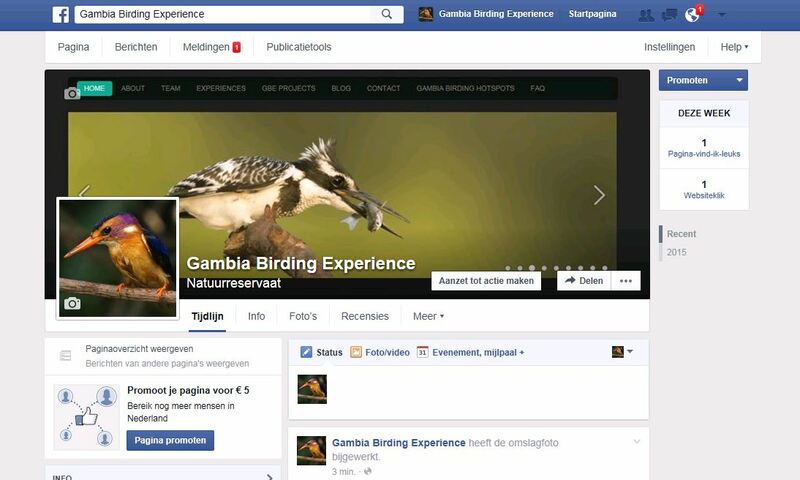 Create an affordable but very complete program that will allow more people to come to te Gambia and see the birds. Work in conjunction with Gambian Birdwatchers association to set the standard of non commercial high level bird service. Finally, please make sure before you join our or any other trip to the Gambia you read this checklist.